Ok, I am not exactly a huge supporter of Sea Shepherd Conservation Society (SSCS) (I am in fact a member of their mortal enemy, the Judean People’s Front, sorry, Greenpeace), I agree with their aims but I’m not sure I entirely agree with way they carry out their tactics. I am not opposed to direct action, I have been arrested more than once for protesting myself, but I do take issue with the way they take action. I don’t particularly agree with their interpretation of the non-violent part of non-violent direct action, this is, however, something that activists will argue about until the end of the earth (doom-laden irony intended). I don’t disagree that property destruction, in and of itself, is a valid tactic for non-violent direct action; Greenpeace cut through chains and locks to access sites and Swoopers at Ratcliffe pulled down sections of fencing in an attempt to shut down the power station. My issue with Sea Shepherd is that they consistently come across as reckless, childish and often incompetent, and these are very dangerous characteristics for people in their position and characteristics that will be attributed to other activists and protesters. Let’s have a look at this recent incident. Fully 16 days after arriving in the Antarctic on its first mission they, by all accounts willingly, put their 26 ton, $1.5m fibre-glass powerboat the Ady Gil in the path of the 491 ton, steel Japanese security ship the Shonan Maru 2, and failed to act to move out of the way. 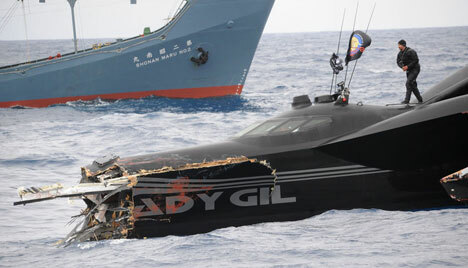 Now whether the Shonan Maru 2 actually deliberately steered into them or not becomes somewhat a moot point, theirs being the smaller, faster, more maneuverable boat, they should have been able to move out of the way preventing the Ady Gil’s total destruction. This seems the equivalent of a fly playing chicken with a rhino, of course they were not going to come out of it well. The fact that they did this really has to make you wonder about how much is planned and how much is them acting on reckless impulses. And of course there is no place for reckless impulses at sea, especially not the in Antarctic. Advocates of SSCS will always argue that yes they use drastic tactics and yes it is dangerous but they get results. Well yes, they do get results, despite nearly killing several crew members in this recent incident, despite the numerous accidents shown during their TV show Whale Wars where someone almost died every episode due to incompetence and despite the fact that Cpt Paul Watson seems to value human life less than those of whales (evidenced by the incident during Whale Wars where when his first mate failed to lower a RHIB properly he nearly drowned 4 crew members Cpt Watson took no action against the First Mate but alienated those who complained about this). And as if to add insult to injury, each of those people whose lives Cpt Watson is so ready and willing to risk, has had to pay $100 for the privilege (to ‘volunteer’ on the boats one must be a member of SSCS, minimum donation to be considered for the crew: $100/year). The issue about Japanese whaling in the Antarctic is a complex one. SSCS say that methods of Greenpeace – applying pressure for socio-political change in Japan – is not stopping the death of hundreds of whales every year. They are right, but by only attacking whaling fleets and saving a few whales every year they are not addressing the problem in any comprehensive way. Both tactics are needed, but only legislation from Japan itself will actually solve this problem once and for all, and maybe put an end to this ridiculous bickering between GP and SSCS.